852 Queen's South Africa Medal 1899-1902, one bar Relief of Ladysmith (3353 Pte H. Benning, Rl. Wt.Surrey Reg.) AEF. 1006 Queen's South Africa Medal 1899-1902, three bars Cape Colony, Orange Free State, Transvaal (1947 Pte. T. Berryman Rly, Pnr Regt.). Toned GVF. 1007 Queen's South Africa Medal 1899-1902, two bars Cape Colony, Orange Free State (1814 Pte. H. Aldersey 21st Coy 2nd Impl. Yeo.). Toned GVF. 991 Africa Service Medal 1939-45, 1939-45, Africa (2) and Italy Stars, named as issued to South Africans. 1939-45 War Medal, SILVER issue. Group of four: 1939-45, Burma, Defence & War Medals mounted as worn. GVF. (8). 1926 Queen's South Africa Medal, 1899-1902, three bars Cape Colony, Orange Free State, Transvaal (3221Corpl H.Ostler Norfolk Regt). GVF with top bar supporting a silver hinged rod for a stand. 1134 South Africa Medal 1877-79, one bar 1879 (2046 Cpl.A. Bennett 99 Foot). RENAMED. VF. 1237 Boer War Pair to Pte J.Ward 5th Dragoon Guards, Queens South Africa four bars Defence of Ladysmith, Orange Free State, Transvaal, Laing's Nek. King's South Africa two bars S.A. 1901 & S.A. 1902 (4325 Pte J.Ward 5th Dragoon Guards) GVF. 1235 Africa General Service Medal one bar Somaliland 1908-10 (2402 Pte. Khamis Haganas 3/ K.A.R.) VF. 972 Queen's South Africa Medal 1899-1902, four bars Cape Colony, Defence of Ladysmith, Laing's Nek, Belfast (3512 Pte. A. McGugan L.N.Lanc. Regt.) GVF. 1248 Kings South Africa Medal two bars South Africa 1901 & South Africa 1902 (5777 Pte. D. Garner Northampton Regt.).GVF. 1465 1939-45 War medal group of four to Pte. 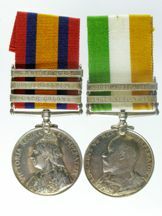 Wilcock R.A.P.C., 1939-45 and Africa Stars, War Medal, General Service Medal GVIR issue bar Malaya (22144348 Pte. R.A. Wilcock R.A.M.C.) Mounted as worn GVF. 1211 1939-45 War Medals inc.1939-45, Africa and Italy Stars, Defence & War Medals. Together with a Kent Education Medal and a Buffaloes Medal. EF. 807 South Africa, 5 medals covering Edward VIII Cape Town visit 1925, Boer War, Union & Independence, wm and bronze. 1710 Boer War Pair to Pte. J. Hill Gordon Highlanders, Queen's South Africa Medal 1899-1902, three bars Cape Colony, Orange Free State, Transvaal (6460 Pte. J.Hill Gordon Highrs), King's South Africa Medal, two bars S.A.1901 & S.A.1902. GVF.